Less than a decade after it bought almost all the shipyards in Europe, South Korean conglomerate STX Corporation (formerly SsangYong Heavy Industries) has reached another milestone in its campaign to basically execute a giant "do-over" by successfully divesting its Turku, Finland yard. Turku, under prior owners Aker and Kvaerner, was perhaps the largest and most dominant shipbuilder in the world for large ocean-going passenger ships (ferries and cruise ships) between the 1970s and 1990s and was responsible for a huge percentage of those types of vessels still sailing. STX got into the European shipbuilding business at a bad time, taking over Aker Yards' operations in Finland (which had already absorbed Kvaerner) as well as Alstom's Chantiers de l'Atlantique yard in France just a couple of years before the economy collapsed and orders slowed and they've been gradually divesting STX Europe since. 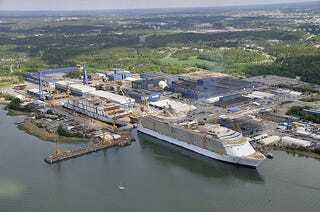 The Vard, Finland yard has already been sold to Fincantieri of Italy, while the Helsinki New Shipyard has been spun off into a joint venture, and now Turku is gone. Its kind of an unusual move for Meyer Werft, they've always been a conservatively managed, family-owned firm that tends to shun large-scale deals. Meyer is known, however, as perhaps the world's leading shipbuilder at the moment in terms of quality and attention to detail for companies that are willing to pay a bit more to get the best. The struggling yard has recently secured orders for three new cruise ships for German-based TUI Cruises, so at least Meyer is inheriting some business, but will need to aggressively go after new orders to keep the place running beyond 2017 or so. The deal leaves STX with their French yard in Saint Nazaire, and 50% of the Helsinki New Yard, look for those to go next.